Candida is a scourge for many people. Until very recently there has been little recognition of Candida and even less offered by way of useful and permanent help to fight what, for many people is a condition which does quite literally ruin lives. In simple terms , Candida in a healthy person is quite normal. When a person becomes Dysbiotic, (see Dysbiosis) Candida can morph to become a pathogenic (injurious) invasive fungus. This can come about as a result of overuse of antibiotics or steroids or in cases of severe stress on he body's defences. enzyme production impaired. All these features allow Candida to establish itself in the intestines, while beginning to weaken the host due to the malabsorption of minerals and vitamins essential for a huge number of chemical processes in a healthy body. Have a look here to see if any of these relate to your own experiences. This would be an indication that your have damaged bacterial flora in your intestines. Once established Candida alters the pH of the intestines, creating the wrong acidity for beneficial bacteria to maintain their colonies. Crucial metabolic reactions fail to take place, while the lack of digestive enzymes lead to digestive disorders (bloating, indigestion, acidity, wind and sensitivities to food groups are indications of this). Candida itself is made up of lipids and protein. By deactivating production of Protease and Lipase it protects itself from damage (but also prevents proper digestion of foodstuffs leading to nutrient deficiancies) It is Lipase and Protease that are the enzymes that need supplementing in order to overcome this deficiency, but at the same time we need to address the underlying cause , which is the Candida itself. (indicators are joint pain, sinus problem, aching muscles, repeat headaches, low level or migraines). Apart from the problems caused by deficiency in minerals and vitamins, Candida can go on to physically invade areas of the body that then allow bacterial infections to take hold. Sinisitus is an example where bacteria can grow on the fungal deposits - requiring antibiotics to tempararily provide relief. (Sinusitus sufferes will understand what I mean here). 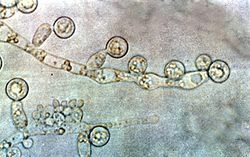 two of these during a lifetime ( which would not indicate an infection), but if you can identify a good number that have been troublesome and/or long term, then it may well indicate an infection of Candida Albicans.